The Human Rights Institute (HRI) is the focal point of human rights at Georgetown Law and helps ensure the Law Center’s place as a center of excellence in human rights teaching and training and in producing policy-relevant and influential human rights ideas and research. 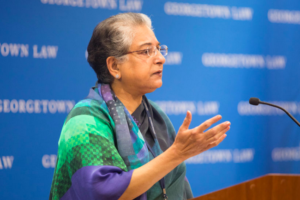 Hina Jilani, the former UN Special Representative on Human Rights Defenders, delivered the Drinan Lecture on "Human Rights and the Rule of Law in Times of Crisis" at Georgetown Law. Looking for clarity on the law and latest policies affecting children and families separated at the border? 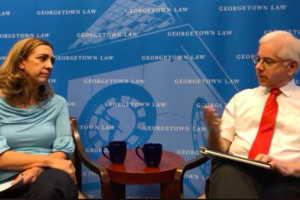 Professor Andrew Schoenholtz and Michelle Brané (L'94) of the Women's Refugee Commission discussed the status of reunifying families, what's driving migration and where the administration's zero-tolerance policy goes from here in a Facebook Live Event. The Human Rights Institute has released its latest report, "Trapped: Cycles of Violence and Discrimination Against Lesbian, Gay, Bisexual, and Transgender Persons in Guyana." For a screen-reader accessible version of this report, please contact HRI's Dash-Muse Fellow at ab2242@georgetown.edu.